We have four different reaction speed games to choose from, two single player games and two that can be played by one or two players. Our Lighter Chaser is a reaction speed game where the object of the game is to score as many 'hits' as possible in a 60 second period. Unlike most reaction games with this game you stand in the middle of four futuristic looking pillars each of which have three reaction light up pads. 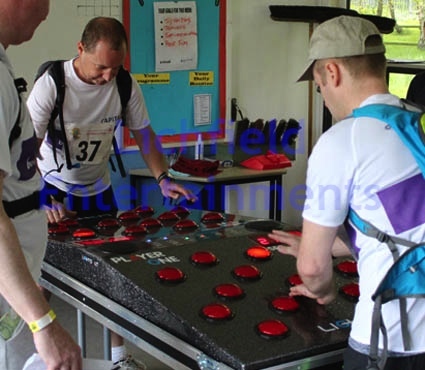 Upon pressing the overhead start button the twelve lights will light up randomly over a 60 second period and the participant must use their reaction and co-ordination skills to try to hit as many as possible. As the 60 seconds counts down the lights get quicker and quicker. On the front of the game is a display which shows the countdown timer and the current score. This game is ultra competitive and popular challenge type activity thats perfect for after dinner entertainment, conferences, and promotions. The game requires a level area of just 5x5ft with a height clearance of 8ft. The game always comes with a uniformed member of staff who will ensure its smooth running and keep track of the scores. 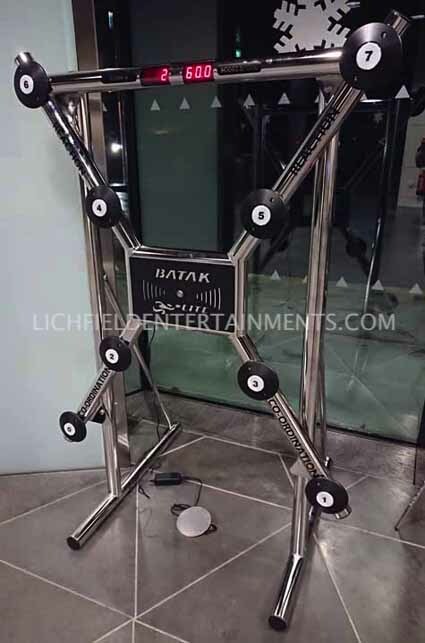 Batak Lite is the most recent addition to our reaction speed and co-ordination games. This single player game can be set to run in 30 second, 1 minute, or even 2 minute games where the player has to strike as many of the light up targets as they can within the set time period. If being used by children the two high level targets can be disabled. 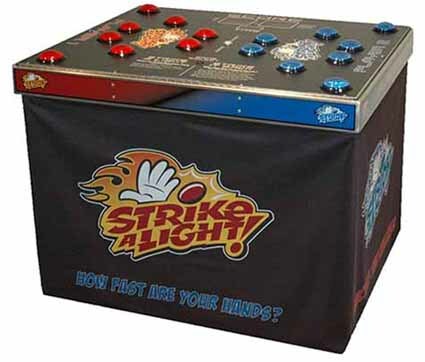 Strike a Light is a head to head game where the winner is the person who scores the most strikes on the randomly illuminating lights in thirty seconds. It can also be played by a single player. In addition to the Strike a Light mode there is also another two player mode called Strike it Back where the first person to strike the light illuminates one of the other players lights. After 30 seconds of fast and furious action the player with the least lights illuminated on their side is the winner. The Lights Out speed reaction game that can be played by either one player alone or two players competing head to head. This game can be set to run for 30 or 60 seconds and has three different levels of difficulty. If you have any queries, questions, or would like to book the Light Chaser, Lights Out, Strike a Light, or Batak reaction speed games please call us on the number below or click to enquire and we will do all we can to help.